Twitter, one of the most popular social network with a recent design upgrade has unveiled the official Twitter App for Windows Phone 7. The all new Twitter client which has now been made available on all Windows 7 Phone, is no different feature wise than those found on other smartphones. While we hoped to see something different offered for the Microsoft phone, Twitter decided to keep it real with features such as Timeline, messages, lists, suggested users and the search pane. 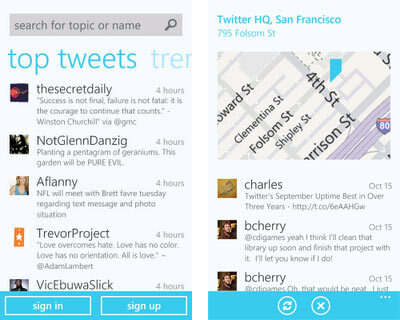 The Twitter App also facilitates new users to sign up for an account right from the Windows Phone itself. Twitter along with the development partner, IdentityMine, made a great effort on creating the new application for the Windows Phone. Twitter made use of the open source REST API library, Tweet Sharp as the foundation for the app and IdentityMine as the release agent which will look towards upgrades and improvements, making it open source for everyone to use.